Why do people love the New Warriors? Part 6: What’s in a name? 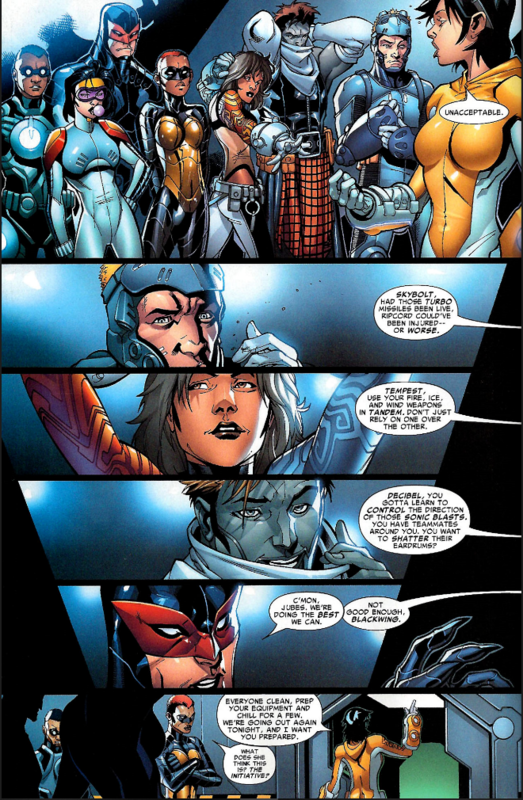 The fourth iteration of the New Warriors lasted the longest, which isn’t saying much. It lasted as long as it did because, I would imagine, it was tied so heavily to current events in the larger Marvel universe. That said, it was a fantastic concept that was poorly executed at almost every turn. A group of characters fighting the establishment — in this case, the Tony Stark run SHIELD — after the events of Civil War and calling themselves the New Warriors is fantastic. It’s exactly what an anti-establishment group would call themselves. Add a mysterious founder who goes by the name and costume of Night Thrasher, and you’ve got a cool concept for a series. The problems start right off the bat, though. The cast that writer Kevin Grevioux and artist Paco Medina introduce is way too large. I realize I longed for a larger cast for volume two, but that was a larger cast of characters that were already known. These were a bunch of ostensibly new characters, all of whom were using special equipment to fight and whose costumes were less than distinct. Their code names were nondescript, particularly given that all of them used to be superheroes of one form or another and had previous code names — this meant that each of them ultimately had three sets of names. And there are NINE of them, not including a tenth one who is convinced to join over the course of the first few issues and not including Night Thrasher himself — or the two tech support characters. That’s THIRTEEN characters on this New Warriors team. Honestly, I’ve read the series three times and if you put a gun to my head and forced me to name each of the members of this team of New Warriors I couldn’t do it. A simple roll call, something so common in superhero team books, would have fixed this problem. The fact that there’s no roll call underscores the fact that these characters don’t matter. Perhaps Grevioux thought that we’d care about them based upon their previous lives, but given how changed most of them are from their previous incarnations it’s impossible to connect them with anything that came before. There are two mysteries at play in the series that are supposed to keep us reading. The first is who is funding the Warriors. The second is the identity of the guy in the Night Thrasher costume. Sadly, neither mystery warrants a great deal of interest. Choosing Bandit to fill in for his half-brother is a bit of a stretch given the last time we saw the character. The main advantage is that Bandit has ties to Silhouette, who has ties to Midnight’s Fire. It’s good to see Sil and Fire again as they are two characters who seldom surface in other books. But Sil apparently registered and now works for the government, which seems at odds with the character. 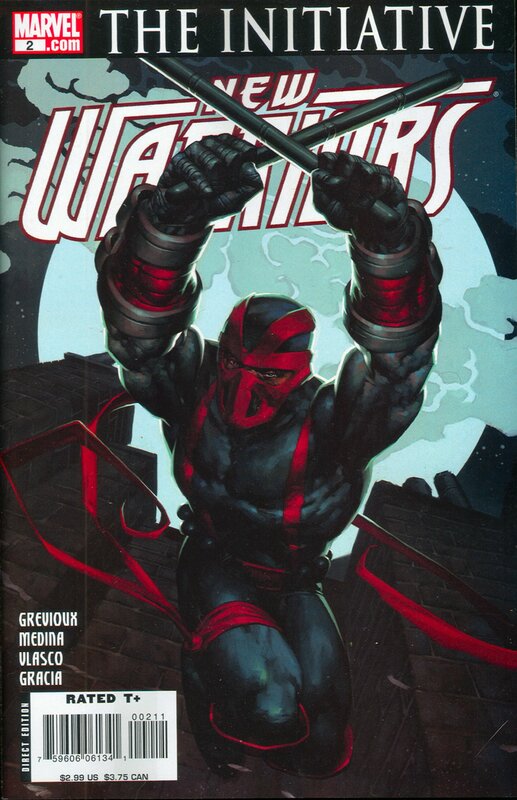 And while we periodically see how other former Warriors are reacting to this new team, they’re never a part of this title like this new Night Thrasher is. Which begs the question: why not? It’s easy to understand the desire to not be beholden to old members of the Warriors, but wouldn’t this concept have worked better if this team had been former members? Who would want to fight back and use the New Warriors name more than former New Warriors? This new team has no powers and, because of that, don’t have to register with the government, but that’s kind of besides the point given that they are active, masked vigilantes. They are already breaking the law, so the fact that they have no powers doesn’t matter. In other words, there’s no real reason to use these characters. There are so many former Warriors out there that could have been used. I suppose the issue is that this team of Warriors didn’t have to worry about their civilian identities and that makes sense, but they are so two dimensional that there’s really no secret IDs to protect. For that matter, this new, powerless team uses technology to fight. Imagine if former Warriors did the same as a way of hiding who they really are, yet still being forced to pull out their powers from time to time to save people. And that’s what eventually gives them away. As I said with volume 2, there’s nothing more frustrating than a story that has the potential to be good but never figures it out. 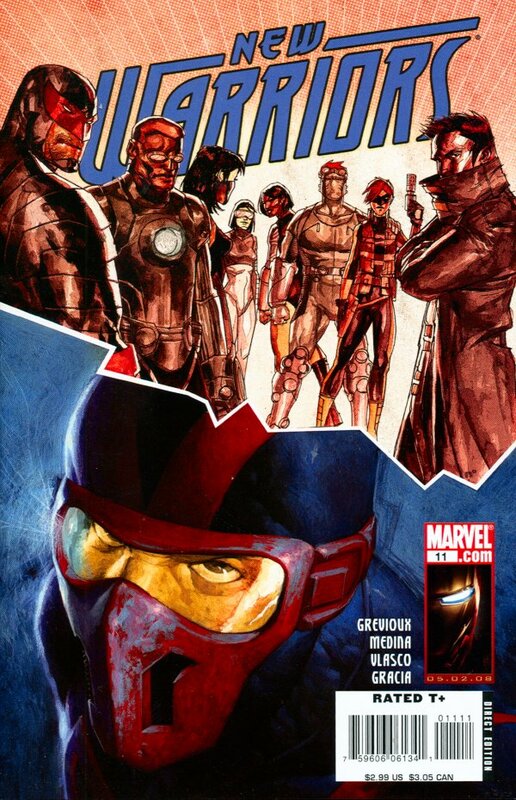 This would be the second (of four) volumes of the New Warriors that wasn’t really about the New Warriors. In the end, nothing about the status quo changes, aside from the new Night Thrasher being revealed as someone other than Dwayne Turner, who were are told is definitely dead. Meanwhile, Justice and some of the other New Warriors (Rage, Slapstick, Ultragirl, Debrii) are getting screen time in Avengers: Initiative while Speedball (as Penance) is busy being a Thunderbolt. The Initiative would fall apart and someone finally decided to stop torturing us with Penance and soon Justice and Speedball were reunited as instructors at the Avengers Academy. Putting them together would eventually lead to the most recent attempt at a New Warriors book.